Apparently, I have to clear something from yesterday’s post up. 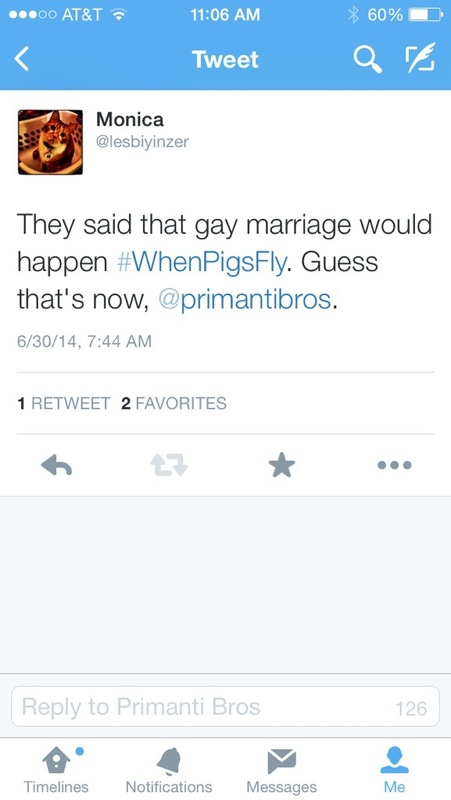 Earlier this week, Primanti Bros. did this giveaway thing and asked Twitter followers to tweet something with a creative use of #WhenPigsFly (the name of their new sandwich). So…I tweeted this. Future SIL Amy was confused and told me I needed to explain the tweet, so I did. Happy, Amy? 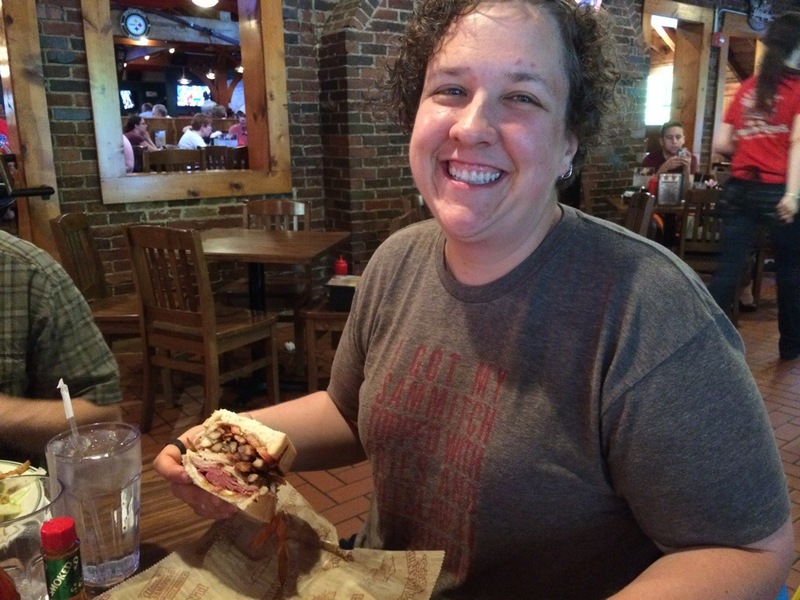 Coincidentally, I went to Primanti’s today and tried the new sandwich, and it was spectacular. Holy crap. Throw some smoked chipotle Tabasco on there (that you either have to ask for or hope you’re seated next to a condiment station and can steal), and it is a party in your mouth. Look how happy I am! Also, it looks a bit like it’s a party in my shirt, too. Going to dinner and picking up cookies (happy birthday, Aubrey! Good choice of restaurant!) was the most productive thing I did. I started watching “Scandal” on Netflix and accidentally watched six episodes. Whoops. But I’m on vacation, so I don’t feel that bad. Tomorrow will be more productive. Tomorrow, I bake a cake, and you’ll be along for the journey. Tune in! It was a good day. Entertaining TV followed by good food and good company. Really can’t ask for more. My staycation is almost over! Oh, no! I meant to be more productive, but I think I’m getting better at this relaxing thing. I think that’s a good thing. And the house (and its necessary work) will be there next week. Right? Yeah! Scandal – I’ve watched from the beginning, It is great….and addictive. You are awesome!!! That picture is adorable!!! You look so good!